You get one of two things when you combine a car and a motorcycle. Your first option is a massively heavy, chromed out two-wheeled cruiser. The other option is a four wheeled, lightweight, open-air kart with a superbike motor under the hood. One is a pleasant way to ride across the country; the other is the Honda 2 & 4 Concept, one of the few things that might give the Ariel Atom a run for it’s money. The design of the kart was done rather democratically. Eighty designers from Honda’s motorcycle design studio in Asaka participated in Honda’s internal “Global Design Project,” and then voted on their favorite. This design won, and was then taken over to the automotive design facility in Wako, Japan, where the two teams figured out how to make the 2&4 a reality. Honda’s designers quote the RA272, Honda’s entrant into the 1965 Formula One season, as their inspiration in creating the 2&4 - which measures in at 119.7 inches long, 71.6 inches wide, 37.6 inches tall, and a claimed weight of 893 pounds. As previously discussed, the Honda 2&4 is powered by the 999cc V4 motor from the new Honda RC213V-S superbike. No, it isn’t getting the U.S. spec 101 horsepower version - it will get the full glory of the 215 horsepower at 13,000 rpm and 87 foot-pounds at 10,5000 rpm “sport kit” motor, which is mid mounted into the 2&4. Power is delivered through a six-speed DCT gearbox. 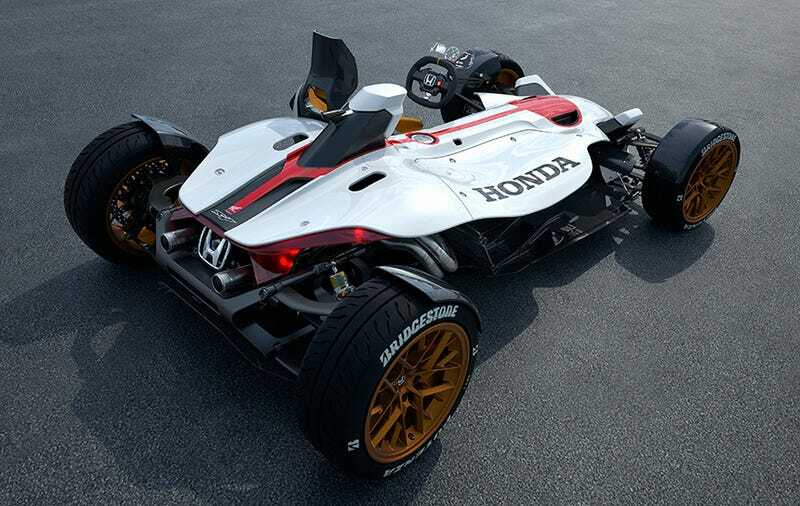 After seeing these pics, I feel a little less stupid about not being able to glean much from the teaser pic Honda released of the 2&4 - though the floating seat design and that trick little heads up display sort of make me too excited to care. The complete and utter lack of any thought given to driver safety means this thing will never see customer hands, but it’s fun to dream for a few minutes before reality sets in. The Honda 2&4 is set to make its debut at the Frankfurt Motor Show, which begins on September 17th.